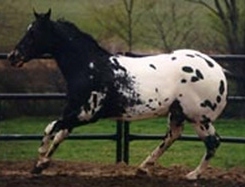 Supremely Zipped (Lenni) is a 2000 ApHC/ApHCC black leopard mare by World Champion Black Magic Zippo and out of ST Star Supreme, a daughter of Reserve World Champion, Bar Star. Lenni is a Futurity Winner and she has earned ApHC/ApHCC points in both halter and color. 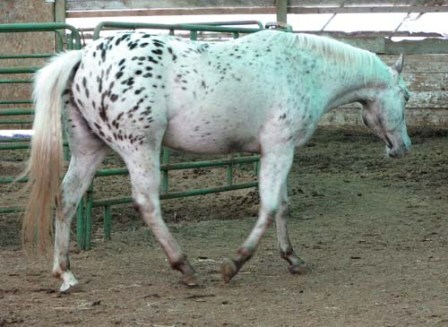 She has been shown in Youth Halter Mares and Western Pleasure at the Appaloosa shows and she has also done well showing at the 4-H level. 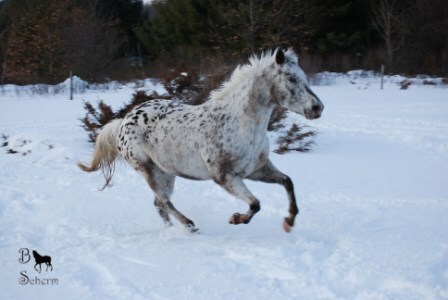 Lenni is a super mover and she has had training in both reining and over fences. 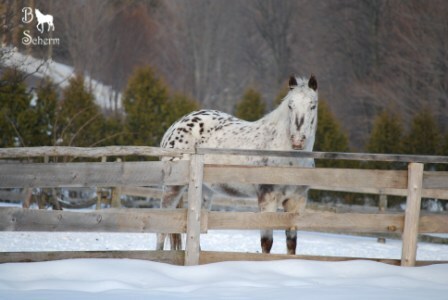 Since her arrival at Pine Hill Stables in 2007, Lenni has been used as a lesson horse and has done a bit of showing. She absolutely loves attention and she has quickly earned her spot as one of the favorites among everyone that has ridden her. Thank you so much to the Fields' family at Sutherland Meadow Appaloosas for giving us the opportunity to own this awesome mare. 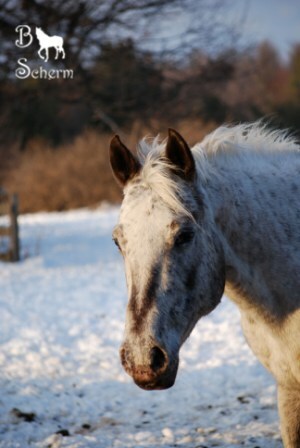 Her sire, Black Magic Zippo is a 1996 black ApHC stallion by Pine Bar Pat and out of Co-Tu. 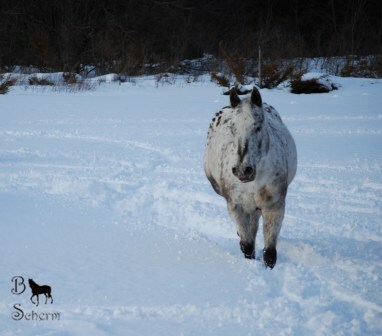 He is the youngest Medallion Winner in ApHC history and the youngest ApHC to receive a Superior Award. 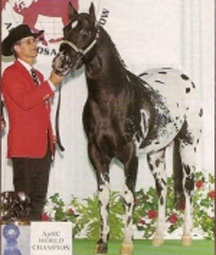 Black Magic Zippo is also a Reserve National Champion and Canadian National Champion Most Colorful Halter Horse. 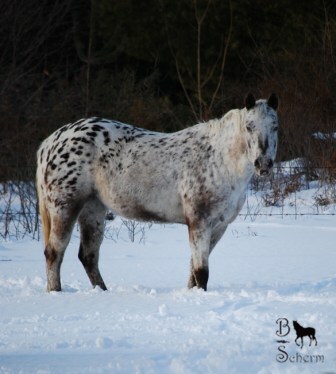 Both photos of Black Magic Zippo are courtesy of Sheila Kobs at Wildwood Appaloosas. 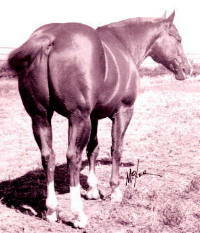 Skipa Star was a 1973 chestnut AQHA stallion by Skippers Lad. 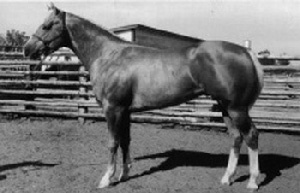 He was a World Champion Halter Horse, a Superior Champion Halter Horse and was on the Leading Sires List for AQHA, producing several World Champions, Reserve World Champions, Superior Halter Horses and Performance Champions. 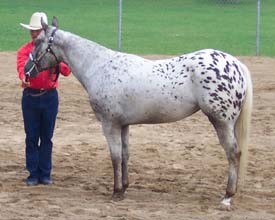 Skips Reward was another well-known Wiescamp bred AQHA stallion. 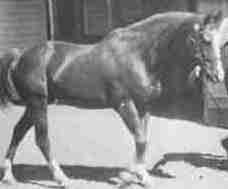 He was a Grand Champion Halter Horse and sire of multiple AQHA Champion Halter and Performance Horses. 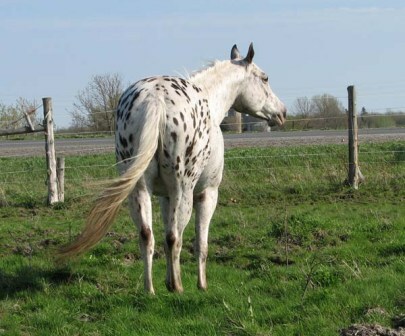 He was remembered as having a gorgeous head and the chrome and the conformation that Hank Wiescamp strived for. 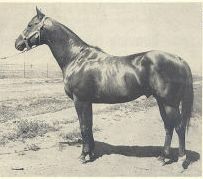 Zippo Pat Bars was a 1964 sorrel AQHA stallion by Three Bars. He earned his ROM in racing, was AAA rated and was inducted into both the AQHA Hall of Fame and the NSBA (National Snaffle Bit Association) Hall of Fame. Zippo Pat Bars sired nine AQHA Champions as well as 16 Superior Western Pleasure Horses and four Superior Halter Horses. Two of his well-known offspring, Zippo Pine Bar and The Investor, were also inducted into both the AQHA Hall of Fame and the NSBA Hall of Fame. 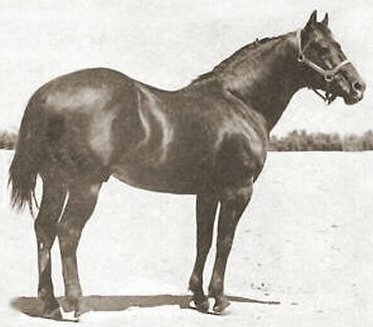 Lenas Bar was a 1954 chestnut TB daughter of Three Bars. Even though she was never raced as a TB, Lena's Bar was well-known in the AQHA racing industry. 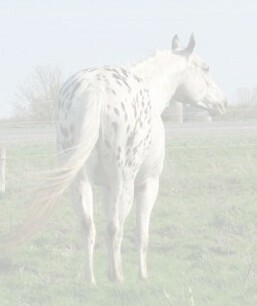 She was AAA rated, had an AQHA ROM in Racing, and was an AQHA Superior Performance Horse. In 2003 she was inducted into the AQHA Hall of Fame and was the dam of World Champion Race Horses, AQHA Champions, Superior Performance Horses, AAA Horses and ROM Race Winners.